I read an article last year about implementing a Client Event Pool and I really liked the concept. Joel shows a very good way to use it but I've been doing my best to find a logical use for it myself. Anyone not familiar with the concept of a Client Event Pool it's covered in Joel's post, but the short version is that a Client Event Pool is a browser-level event handler which is designed to allow events to be easily passed between unlinked components. One component can raise an event which can be chosen to be handled by any other. Inversly events can be listened for even if the component isn't on the page or the event isn't used. This isn't really a new concept, you can achieve it (to a certain extent) with standard ASP.NET, with the OnClient<EventName> which is on a lot of the standard ASP.NET controls. And in this article I'm going to look at how to integrate a Client Event Pool with the ASP.NET AJAX Control Toolkit's Modal Popup. Now, don't get me wrong, this isn't the only way to add the events to a modal popup control, there are a lot of event handlers which can be added without a Client Event Pool. 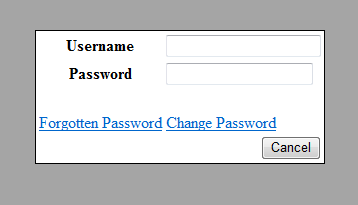 This all came about when I was tasked with integrating a login, forgotten password and change password component. Each were their own modal popups and each were separate .NET UserControls. I wasn't involved with developing any of them, and I didn't want to really do much to modify any of them too much and introduce more bugs in the system by screwing around with stuff I'm not familiar with. I also didn't want each of the popups to overlay each other, it doesn't really look that good (as I'll show shortly), so I needed a way to hide the master popup when the child was shown, and then when the child was hidden I want the master to reappear. So now it's time to tie up the master control with the child controls. To do this I'm going to have 2 events raised from the child controls, one for when the popup is shown and one for when it is hidden. I'm also going to have an event which can be raised elsewhere on each child control which will initiate the showing of the popup (you could add one for the hiding, but I'm using the inbuilt hiding from the CancelControlID property of the modal popup). Lets have a look at how they work, first off I locate the the Sys.Component instance of the ModalPopup control. There are showing and hiding events fired off from the ModalPopup, so I'm going to add a handler, the handler though will just be a stub which in-turn raises an event within our Client Event Pool. I've given them names which will indicate what they are used for. Lastly I'm going to add an event handler so anyone can raise an event which will show the popup. Next we set up the Client Event Pool to listen for the hide and show events from our child controls. It listens for the events to be raised and when they are it'll either hide or show the modal on the current page. Admittedly I've gone a little bit overboard with my events between the two child controls. Each could just raise events like hideParent and showParent, and then I would only need 2 handlers against the Client Event Pool, but to illistrate my point I've gone the verbos method. Admittedly static images can't really show how it works, but it's much nicer to not overlay popups, and ability to having popups automatically hiding and showing the loss-of-focus ones is a really sweet idea. I'll admit that it's possible to do this without the need for a Client Event Pool, you can expose all the appropriate properties on the child controls which then can be set appropriately within it's parent, but think of it a step further, if you wanted a link on the Forgot Password to the Registration page. Because they aren't really aware of each other it is very difficult to achieve (but not impossible). Your UserControl can also expose wrappers to the Showing and Hiding client events on the modal popup, but it still has the same problem as mentioned previously.